Hari Alluri has been described by US Poet Laureate Juan Felipe Herrera as a writer who "carries a new, quiet brush of multi-currents, of multi-worlds to paint this holographic life-scape." In The Flayed City, he offers an intimate look into the lives of city dwellers and immigrants in a collection of charged poems that sweep together "an archipelago song" scored by memory and landscape, history and mythology, desire and loss. Driven by what is residual--displacement, family, violent yet delicate masculinity, undervalued yet imperative work--Alluri's lines quiver with the poet's distinctive rendering of praise and lament steeped with "gravity and blood" where "the smell of ants being born surrounds us" and "city lights form constellations // invented to symbolize war." 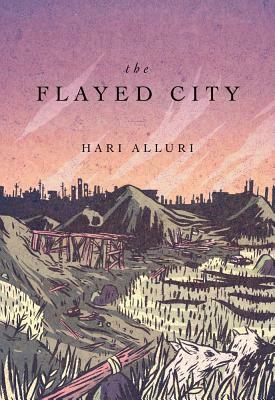 The Flayed City offers a powerful glimpse into a secondary world whose cities, cultural histories and trajectories are hybrids or "immigrated" versions of this one. San Diego-based poet and teacher Hari Alluri is the cofounder of Locked Horn Press. “Hari Alluri is Michaux for our time. Which is to say: he is the poet who is able to find myth in our days of sorrow and displacement, when so many lose homes and identities, Hari Alluri offers a new music. When cities are destroyed by fire, Hari Alluri offers lyric fire that heals the heart, that lets the imagination save us. When there is nothing left to say and the page of our drive to stop the pain is brightly-lit and blank, Hari Alluri brings a few words that sing, brings them by the hand, gives them to us—not just words but images, sparks, from which the fire comes, from which whole villages are alive again. This is the poet to live with."